A fresh spin on citrus! 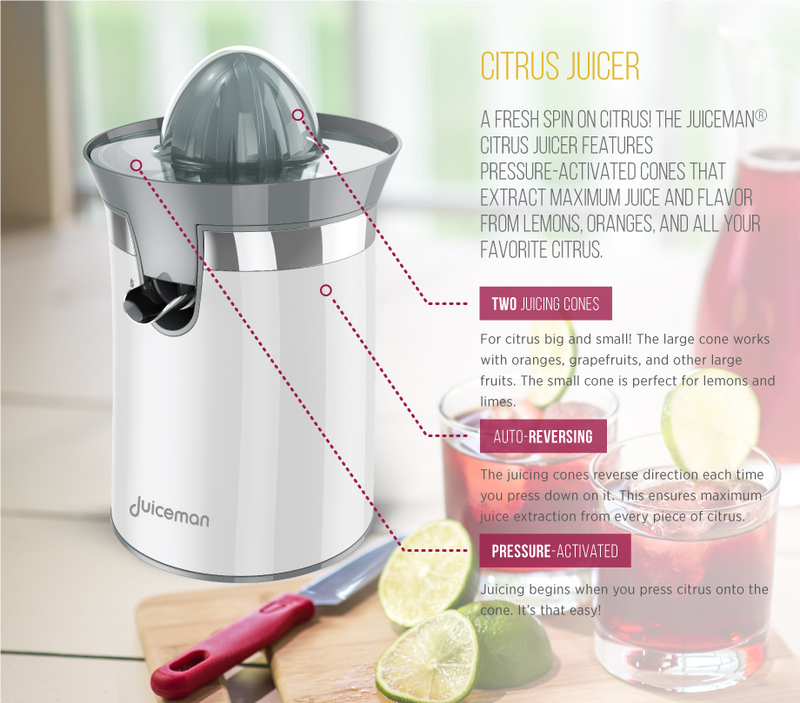 The Juiceman® Citrus Juicer features spinning cones that extract maximum juice and flavor from lemons, oranges, and all your favorite citrus. Create delicious homemade orange juice and lemonade in no time, or add a splash of fresh juice into smoothies, mixed drinks, and more. The 40-watt motor powers large and small juicing cones, and the auto-reverse function guarantees you get every last drop. Plus, all removable parts are dishwasher-safe for simple cleanup, and a storage lid keeps the juicer dust-free and ready to go whenever you need it. 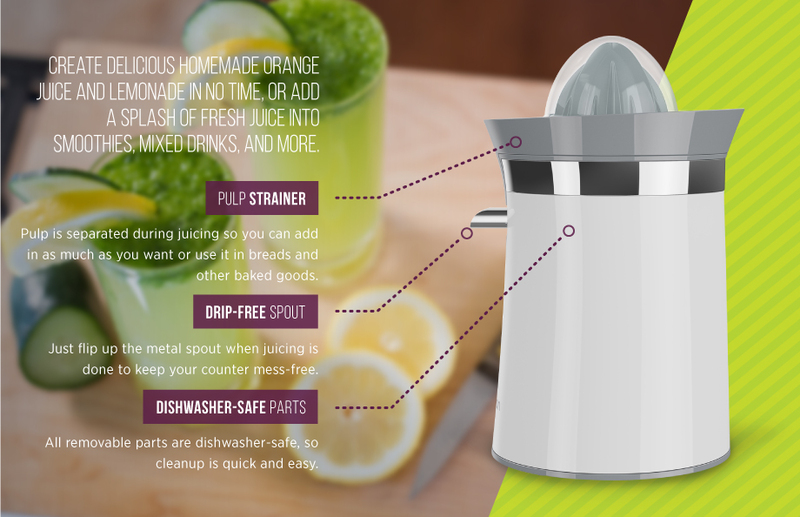 Citrus Juicer is rated 4.1 out of 5 by 25. Rated 5 out of 5 by jackie27 from Juiceman- Citrus-Juicer I juiced large oranges and small lemons. It had enough power, but. slowed slightlywhen I pushed down to hard. Over all for daily use it worked very well. Rated 5 out of 5 by kab64 from Easy to use! The Juiceman Citrus Juicer was so easy to use. Just drop the strainer, pulp container and juicing cone on and you are ready to go. The juicer made quick work of the ruby red grapefruit I juiced.Cleanup was quick and easy. I can see myself using this juicer every morning. It is small and takes up very little space on my counter top. Rated 5 out of 5 by LanaB from Easy to use! I loved this juicer. It was so easy to use that even my 5 year old niece was able to make her own juice! It assembles easily and is easy to clean. We did both orange and grapefruit juice and had no issues at all. This is perfect for those of us who like fresh juice with no extras. Also, if you plan on using it every day, it doesn't take up much space on your counter or fits easily into a cupboard. Rated 5 out of 5 by axepupp from works wonderfully i love this juicer.nothing is better than fresh juice and with this its so simple to use and works great.i love the features and the stylish look of the product.it would make a great gift for chrismas or any holiday and be a great improvement on the juice you get in store and a healthy alternative to sodas.i feel it would motivate healthiness to have fresh juice anytime you want. Rated 5 out of 5 by abcadkins from Works really well! I received Juiceman Citrus Juicer today and couldn't wait to use it. Luckily, I had some limes on hand... I am absolutely thrilled with the performance of this citrus juicer! I have never gotten so much juice out of one lime before. It's easy to use ~ just cut the fruit in half, press it over the top, and the motor does all of the work! The handy pour spout is nice, too ~ if your cup gets full just flip the spout up and change it for another ~ it doesn't spill! With winter approaching and citrus juice like oranges and (our favorite) grapefruit coming into season, this juicer is about to get quite a workout. But it won't be put away after winter, no way! Lemons for lemonade all year long? Yes please! Rated 5 out of 5 by valliam123 from Juiceman Juicer Review I used the juiceman juicer and was very impressed, it works very easy and produces a good amount of juice per piece of fruit. I can't wait to make a half gallon of orange juice,. Rated 5 out of 5 by Arizona Bob from Fast and well made We have two grapefruit trees that are loaded, they are big and this juicer handles them quite well and also fast. It does a good job of separating the pulp and seeds. It is also easy to clean. It far exceeds my expectations. Rated 4 out of 5 by srenee13 from Fancy Juicer I enjoyed using this to juice my oranges and lemons but that's all it's really good for. It's more convenient and quicker than a traditional hand juicer but it's unnecessary. A plain old school cheap one does the same thing. If I would have actually purchased this instead of receiving it to product test for free, I would have said it was a waste of money. Get a real juicer instead. Much more useful. Rated 4 out of 5 by Mercedes82 from Easy to use This juicer is easy to use. It is lightweight, so I can easily bring it out as needed. I am able to juice a variety of fruits. Rated 4 out of 5 by Gmc38 from Good Juicer The Juiceman is a good and easy way to juice lemon and lime juice. I used to juice lemons for lemonade. It was convenient to have when I make ceviche or other dishes were I need a lot of lime or lemon juice. I like the drop down spout that helps me stop the juice from pouring. Rated 4 out of 5 by deanokat from Good Basic Citrus Juicer The Juiceman Citrus Juicer is pretty good at what it's designed to do: Get juice out of lemons, limes, oranges, and grapefruits. There isn't anything too fancy about this juicer, but that's okay; its simplicity is what I like about it. The two different size cones make it easy to juice all citrus fruits and clean-up is easy, too, because the parts are dishwasher safe. I think the Juiceman does an excellent job at keeping pulp out of the juice as well. Its compact size makes it easy to keep this juicer on the counter and handy at all times. I must say, I especially like the storage lid that keeps dust out. If you're looking for a citrus juicer and don't want to spend a ton of money, this Juiceman will likely satisfy your needs. My biggest complaint? I think a slightly more powerful motor would've made this juicer perfect. The juicer has never failed me, but sometimes it sounds like the 40-watt motor is struggling a bit. I still highly recommend it, though. Rated 3 out of 5 by Fed44 from Parts break especially the nozzle It’s a great blender but the nozzle isn’t made to last - the nozzle should be all metal rather than plastic - dedign flawOtherwise I am very happy with the juicer! Rated 2 out of 5 by Kimberlykai from I liked it.... I used it a few times and then I went to make my first pitcher of lemonaide and after the 4th lemon it stopped working! Now I don't know what to do....so bummed this is the first juicer I've ever tried so I have nothing to compare. It seems a little cheaply made? Rated 1 out of 5 by Tambra from Not working out so well I got this as a gift a month ago and it worked great the first time I used it....juiced several oranges and lemons. Next time I went to use it, it wasn't working properly. I tried again today and ended up using my manual juicer. A waste of money if you ask me.